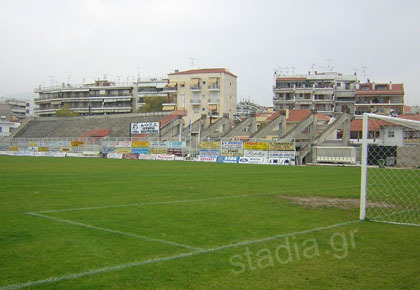 The stadium is located in Drama, in eastern Macedonia (150 km from Thessaloniki and 670 km from Athens). The city is served by the international airport of Kavala, which is about 60 km away. You may also get there by train. The stadium itself is located in the western part of Drama. As you enter the city from Thessaloniki, you will reach a set of traffic lights at the junction with Odysseos Street. Turn left (towards "Serres") and you will see the stadium on your right after 300m. More data: Doxa Drama Stadium initially had only one stand, the west one, while the north curve was built in the early 1980s. About ten years later begun the construction of the east stand. This was, however, never meant to be completed. Works were halted because of lack of funding and this stand still remains half-finished. Club officials are hopeful that the construction of the east stand will re-commence in the next few months. When completed, it will add about 3,000 seats to the stadium's capacity. There are more short-term plans, however, which involve the installation of plastic seats on all stands and lighting on four pillars. The stadium is owned by amateur G.S. Doxa Drama.